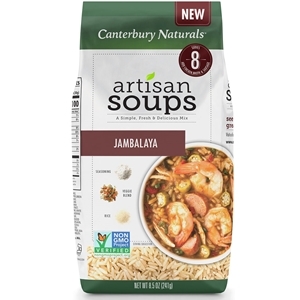 Canterbury Naturals Jambalaya is a savory rice and tomato stew studded with peppers, onions and traditional Creole spices. Keep this stew simple by adding chicken or kick it up with the addition of andouille sausage and/or shrimp! NOTE: In the fall of 2018, Canterbury Naturals reformulated all of their soups to be non-GMO. The new soups have slightly different recipes, ingredients and flavors but are still produced with the quality you have come to expect from Canterbury Naturals. 1. Remove seasoning packet and set aside. Combine remaining contents of soup mix, water and chicken stock in a stock pot. Bring to a boil, cover, reduce heat and simmer for 20 minutes. 2. Add chicken, sausage and shrimp (if using) and cook an additional 10 minutes. 3. Combine seasoning packet with 1 tbsp cold water. Stir with fork until smooth. Add to soup while stirring and simmer for 5 minutes stirring occasionally. (Note: If using prepared chicken add during the last 5 minutes of cook time). Tip: Using andouille sausage is the classic choice for the stew. Serve with pickled okra for a cajun fare. Organic Brown rice, Vegetable Blend (Red Bell Pepper, Green Bell Pepper, Tomato, Onion, Chive, Celery), Seasoning Blend (Sea Salt, Corn Starch, Cane Sugar, Organic Whey, Maltodextrin, Onion, Yeast Extract, Garlic, Spices [Celery Seed, Thyme, White Pepper], Turmeric, Parsley), Soup Base (Wheat Flour [Wheat Flour, Malted Barley Flour, Niacin, Reduced Iron, Thiamin Mononitrate, Riboflavin, Folic Acid], Chili Pepper Powder [Chili Pepper, Salt, Spices, Garlic], Spices [Cumin, Oregano, Basil, Chili Pepper], Sea Salt, Garlic, Smoked Paprika, Parsley). * Allergy Information: Contains: milk, wheat. Made on shared equipment that processes eggs, milk, soy, wheat and tree nuts. Tastes great and natural. Filled with flavor; doesn't taste at all like it came from a packet.